"To provide a caring and innovative training program in an enjoyable environment where the players will be given a pathway and opportunity to maximize their potential as individuals and tennis players." 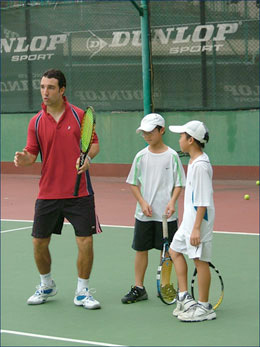 Hong Kong International Tennis Academy was established after many years of successful practice by former ATP Touring Professionals and Head Coaches of National Associations and National Teams. Our program provides a caring and nurturing training environment that has been designed to provide a pathway and to foster the long term development of our players. We firmly believe that through our innovative training program and regular competition, we can help our players reach their full potentials, and at the same time build their characters. Our professionalism is built on the enthusiasm and dedication to both our players and our work. This has been proven by the fact that we are the only academy in Hong Kong that continuously produces Hong Kong’s top ranked players. We also have successfully placed our players into US Colleges, receiving scholarships. Hong Kong International Tennis Academy’s professional services are made up of the efforts of its devoted and qualified coaching staff, who are dedicated to the delivery of quality program and prompt and attentive response to our players. We believe that we have the right combination of people, knowledge and expertise to provide an innovative long-term program to our progressing players. We know what it takes and what has to be done to be a successful tennis player at both the professional and US College level. We understand that coaching and advising young players is an ongoing process, such relationship can last for many years; therefore establishing a permanent relationship is just as important as technical understanding. Our experience has taught us what players and parents value most in professional relationship.